If you or someone you love has a lifelong disability, navigating everyday life requires that you’re both creative and adaptable. If you’re moving into a new home there many additional things you have to consider to accommodate your needs. 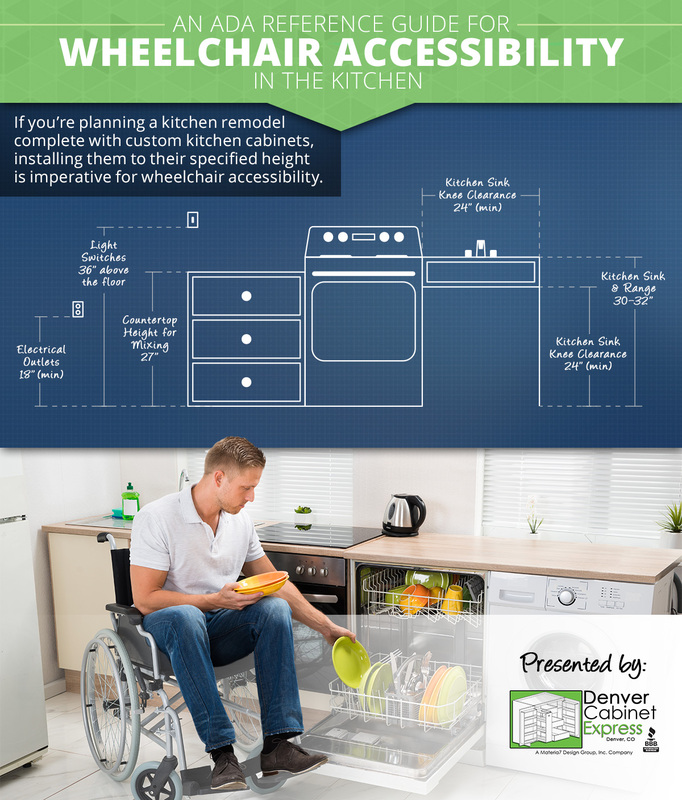 Throughout this article, we’ll explore things you and your family can to do to make your kitchen more ADA (Americans with Disabilities Act) friendly, including custom kitchen cabinets. 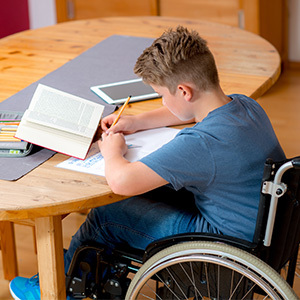 Modifying your home to be ADA compliant takes a little more work than just moving things around to accommodate a wheelchair, so if you’re buying a new home and need to make accommodations, consider the following. Each home entrance should have a wheelchair ramp. If stairs are present, a vertical platform or stairway lift will need to be installed. If the home has an abundance of carpet, you may want to factor in new flooring, as carpetingcan be difficult for wheels to travel from room to room. Standard doorways can also create a hassle for wheelchairs to get in and out of. Widening doorways provides a pleasant and safe experience. When it comes to specific rooms, the kitchen can be one of the most difficult to navigate if it isn’t ADA compliant. Thirty million Americans face this situation, which can throw a wrench into independent living. 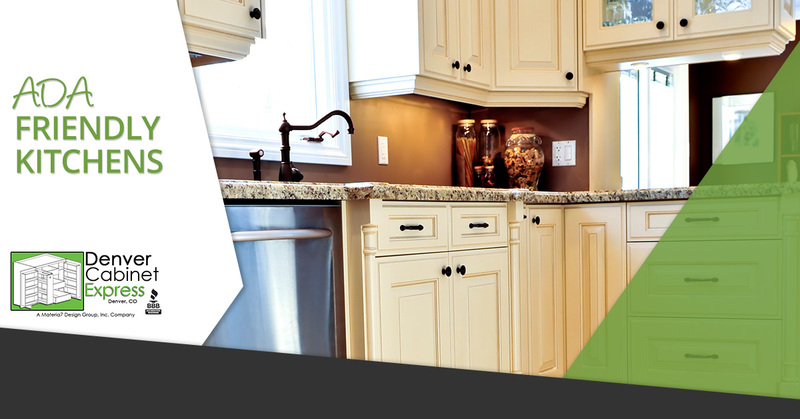 Kitchen modifications are very doable and can increase the safety and accessibility in a home. Multiple-level countertops - Having multiple-level countertops is hugely important for someone at wheelchair height to be able to reach things on top in addition to preparing food on them. Easy-to-reach appliances - Paired with custom kitchen cabinets and countertops that are the correct height, easy-to-reach appliances, such as the microwave and range, are a non-negotiable. Customizable refrigerators are also available. Pull-out shelves - Having shelves in an ADA home really isn’t helpful, but using pull-out shelves within reach allows the person to access pots and pans, dishes, and shelf-stable food to make preparation possible. Pull-out drawers (auto close) - Pull out drawers with an auto close feature is also imperative for daily living in an ADA kitchen. Again, this relates to accessibility and making independent living possible. Kitchen sinks - There are specialized kitchen sinks that leave an open space for a chair or walker, so a person can sit and wash produce or clean dishes. C-shaped pull or grab bar - If a person has limited dexterity, traditional knobs on custom cabinets can be tricky and hard to open. Installing a “C” shaped pull or grab bar makes opening cabinets much easier. Outlets at wall height - Outlets are often forgotten in the ADA kitchen. Having an outlet located on the side of a countertop makes plugging in cooking appliances, like a toaster, achievable. So don’t forget the outlets! Light switches - Being able to access light is also important when entering the kitchen. Like with electrical outlets, install light switches at a proper height. If you’re preparing for a kitchen remodel that is ADA friendly and compliant, shop our custom kitchen cabinets to create a beautiful yet functional kitchen that will meet your needs.